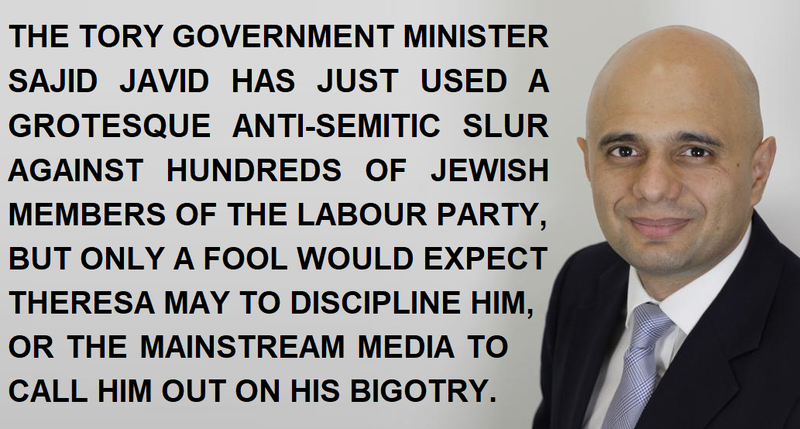 Sajid Javid just baselessly called hundreds of Jewish Labour Party members "neo-fascists"
The Tory government minister Sajid Javid has just stood up in parliament and accused the Labour activist group Momentum of being "neo-fascists". Aside from the fact that it's the political left who have always stood in solidarity with the Jewish people to fight against actual fascists from the political right (as at Cable Street where they beat the British Union of Fascists in the 1930s, when they beat back the rise of the National Front in Lewisham in the '70s, and the regular criticism of modern neo-Fascist hate groups like Britain First from the political left), there's also the well-known fact that the leader of Momentum is a Jewish guy called Jon Lansman. Now if we know anything at all about anti-Semitism then surely we know that it's deeply anti-Semitic to baselessly resort to calling Jewish people Nazis just because you disagree with their political views. So where is the tide of outrage about this hard-right government minister deliberately and offensively tarring hundreds of peaceful anti-fascist left-leaning Jewish people with the vile ideology that resulted in the mass genocide against their ancestors? 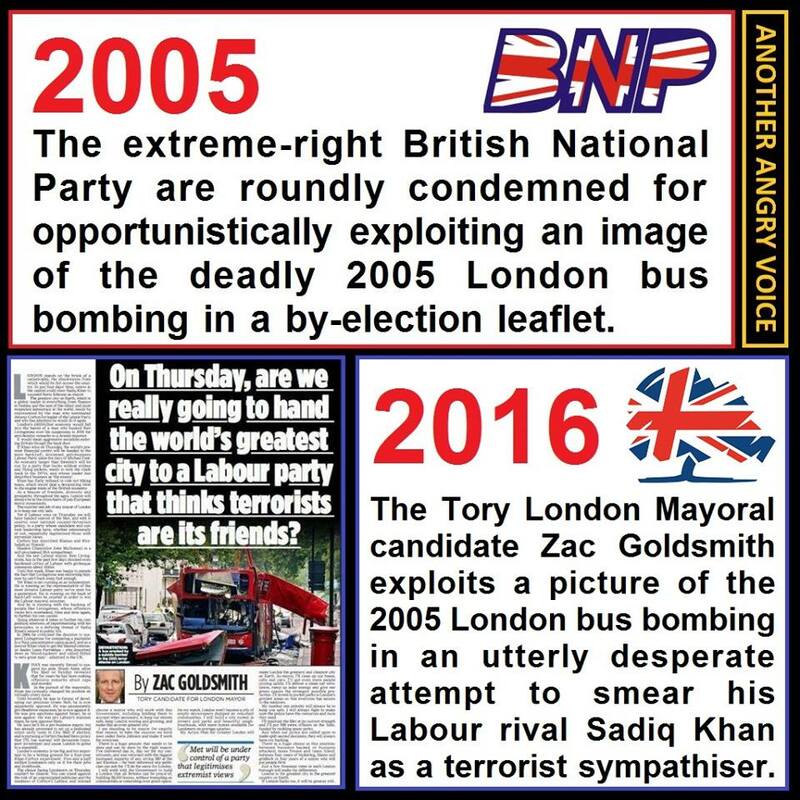 When Zac Goldsmith and the Tories used vile extreme-right propaganda tactics copied straight out of the BNP playbook to attack Sadiq Khan during the London Mayoral election in 2016, guess who remained absolutely silent on these disgusting tactics? Then there was the blind eye that Javid turned when the actual fascist Britain First leader Paul Golding recently threatened to violently intimidate anyone who dares to oppose or criticise right-wing politicians like Rees-Mogg. Then there's the fact that Javid refused to criticise his fellow Tory MP Bob Blackman after he shared extreme-right Islamophobic propaganda on his Facebook page just a few days before he hid behind parliamentary privilege to shout his offensive slurs at Jewish Momentum members. When his own political party used neo-fascist tactics copied straight from the BNP, Sajid Javid remained silent; when the Britain First neo-Nazi thugs threatened to act as a violent enforcement militia for the Tories, Sajid Javid remained silent; when his fellow Tory MP shared disgusting fascist propaganda on Facebook, Sajid Javid remained silent. And then after all of that silence he resorts to full bore anti-Semitism by slurring every single Jewish member of Momentum as neo-Nazis. 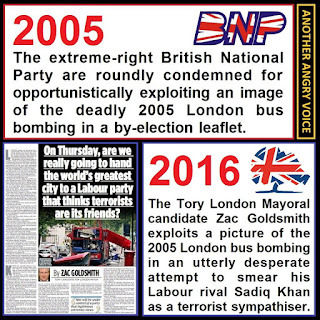 Just like Javid's own personal attitude to Zac Goldsmith's disgusting use of neo-Nazi propaganda tactics, his fellow Tories will doubtless turn a blind eye and refuse to hold their own to account. 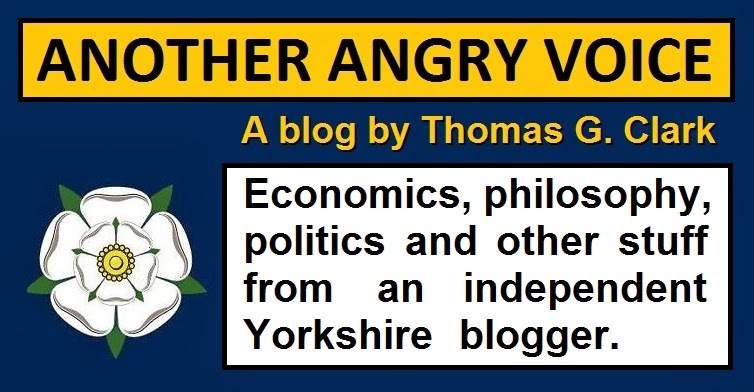 And given the blind eye the mainstream media have turned to half a dozen other bigotry and bullying scandals within the Tory ranks this week, few would expect mainstream journalists to call him out either.